With all of the attention being given to next week’s “Elseworlds” crossover, it’s easy to overlook the fact that The Flash is hitting a remarkable milestone tonight—it’s 100th episode. Fittingly, the four-plus years since the series made its debut have passed quickly, but they’ve left some truly memorable moments in their wake, from the reveal that the trusted Dr. Harrison Wells was actually the Reverse-Flash, to the Flash’s frightening first confrontation with Grodd, to Barry’s constant time-travel shenanigans, to last season’s wedding between Barry and Iris. Many of those moments get revisited in tonight’s landmark episode, “What’s Past is Prologue.” Directed by Tom Cavanagh, the hour finds Barry and Nora going back through time to obtain things they need to defeat Cicada, and in the process, witnessing some of the defining moments of Barry’s life…and the series. 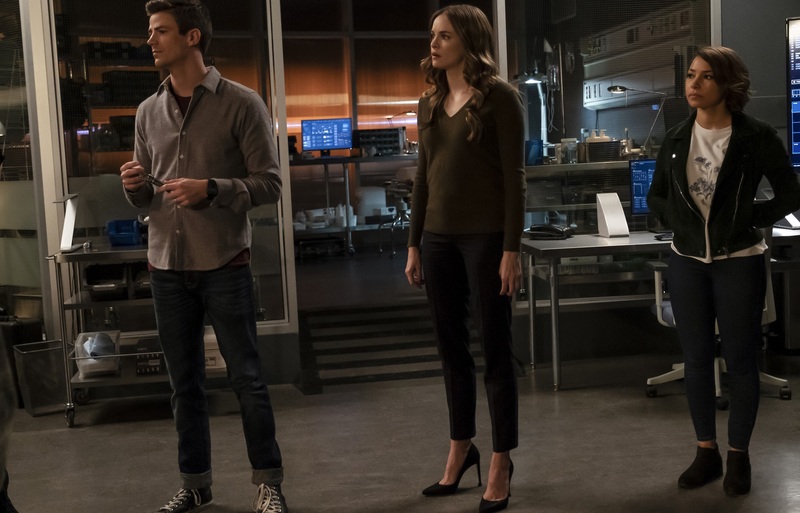 To learn what we can about this pivotal season five chapter, and discover what hitting one hundred episodes means to the people involved with the show, we sat down with Cavanagh for a discussion about all things Flash, including what went into creating the episode, how he feels about his character this season and which of the many Wells we’ve seen so far has been his favorite. First and foremost, how does it feel to be at 100 episodes? More often than not, in television a show gets taken from you before you’re ready to let it go. That’s almost always the case. So, for this one, we said we were going to do season one as well as we can, and if we don’t get renewed, at least we’d be able to say that we did it. We got the story out there and we’re proud of it. Cut to five years later, we’re at episode 100 and still going. It’s a surprise and an honor any time you get anywhere near triple digits, and for us to do it on this show that we all really care for, we’re just really grateful for that. How did you wind up directing the episode? That seems like it would be a pretty big thrill as well. They claimed not to be, and here we are! Did you know what it was going to be about at that time? We knew the broad strokes, but [Executive Producer] Todd Helbing and the writers and I spent a lot of time crafting it. My main misgiving was that when you do a benchmark show, I think the temptation is to give a nod to the moments, characters and storylines that got you there. But the danger is that you have fifty minutes of television, and if you picture it as I do, as one comic book, you want the person who’s opening that comic book to be delighted by the time they close it. You don’t want them to think that all we did was a lot of cataloguing and referencing. My vote was to tell a really good story right now, and that would be our way of honoring the hundred—with a good, clean story. Todd and the writers came up with this idea that Barry and his daughter, Nora, have to go back in time to get certain tools with which they can defeat our current villain, Cicada. It was kind of a genius idea because then we could brush shoulders with some of the moments and things that we really enjoyed doing, but we’re doing it in an organic fashion. It was a really good conceit that allowed us to not bury our storyline too much, but also allow us to honor the moment and the people that got us to one hundred. Was it fun revisiting some of those previous seasons? As an actor, I don’t watch my stuff, but as a director, I believe in being as meticulously prepared as one can be, and that involves knowing everything there is about what you’re directing. In this instance, it’s these prior shows. It was so weird for a guy who never watches his stuff to be put in a position where I had to watch these episodes again and again and again. But it was all to make our 100th episode that much better. It also faces its own challenge in that you have to revisit those things, but with a different angle or perspective than you had the first time. So, suddenly you’re using all of this new technology—like digi or green screen—all of these elements, and putting someone in who may not be familiar with the scene because they weren’t there the first time around. We see so much of this episode through Jessica Parker Kennedy’s eyes. We see a lot of these moments not through someone who’s been through them, but through someone who’s never seen them. So, it’s essentially the viewer watching the viewer. This season’s Wells, Sherloque, is probably the most colorful Wells you’ve gotten to portray for more than one episode. How do you keep him from becoming a caricature? It’s funny because in the one-offs I tend to swing for the fences because you can, right? But even those guys, in my mind, they’re real guys. They exist. The situation is comic, but they’re not. I think that’s part of it. Sherloque’s a guy who’s on a little bit of a run from the ex-wives. He’s colossally intelligent. I think when creating these things, part of it is a question of what we don’t have in the show. Grant [Gustin] is so winning, Candice [Patton] is so winning, Jesse [L. Martin], Carlos [Valdes], Jessica, Danielle [Panabaker]… They’re all very positive models. So, when I come in, I might try to find something that isn’t so positive. I loved playing Harry Wells. This guy was antisocial, arrogant and didn’t carry himself with the best graces, but ultimately his intelligence and loyalty helped him carry the day. This was a guy who showed his bond rather than talked about it. I liked that. His actions were who he was. Because of his cantankerous nature, he was sort of a daily antagonist, which we don’t really have on the show. So, that what a gap I thought to fill. Then, when I was doing H.R. Wells, it was an attempt to lighten things up and bring in a bit of humor. He was a really enjoyable, fun character to play, but maybe not the brightest bulb in the bunch. Now we have Sherloque who is incredibly smart, so you can’t sleep on him. You have to honor the fact that he’s that intelligent. But also, he can bring a certain comedic element. I think it’s good for our show to have that. For me personally, if you’re fortunate enough to do a long-running show and not just play one character, it’s an incredible privilege. I love it. I feel like there’s a lot we still don’t know about Sherloque. We know he’s a brilliant detective and that he’s in some financial trouble. What else can you tell us about him? Will we be learning more? Sure. There kind of always is, right? I remember with H.R. Wells, from the moment Todd Helbing and I came up with the character, we had these drumsticks because we were going to create this tableau where he ultimately sacrificed himself. The drumsticks were going fall to the ground and you were going to realize that it wasn’t Iris [who was killed by Savitar] after all, but H.R. That was always in our back pocket, but we didn’t tell anybody. We purposely did it that way. Can you trust him, or can’t you? Everybody knows that Barry’s good, but if you have a character you can wonder about a little bit, I think it helps the show. Do you have a favorite Wells? That’s the question that I get asked the most, and it sounds like a politically correct answer to say you can’t pick between them, but I think it would be a disservice to say that I like one better than the others. H.R. was so much fun to play, I love playing Sherloque, and Harry’s gruffness was a blast. It’s a type of character that I haven’t historically had many chances to play, and I really enjoyed having that chance to play one. To me, the starting point, though, always will be Reverse-Flash, Eobard Thawne. I wouldn’t be doing this show if it weren’t for that character. This show is always going to have to have him coming out of the folds, occasionally. So, one hundred episodes in, is there anything you’d like to tell the fans? Just that, as I mentioned earlier, we understand how rare it is to hit the century mark. So much of life is fleeting, and even when you’re on a long-running show, you know that it’ll be over before you know it. You could either proceed from entitlement, or you can proceed from gratitude, knowing that you’re grateful for the moment you’ve been given. When I talk about being a part of a moment like that, to say nothing about acting in or directing the episode, that’s how I feel about it. I’m just very grateful. The Flash's 100th episode, "What's Past is Prologue," airs tonight at 8 p.m. (7 p.m. CST) on The Flash.